It was in the 1955 intake at The Edinburgh College of Art where Bill Smith, Roy Williamson and Ronnie Browne first came to know each other. Bill was in Architecture, Roy and Ronnie in Drawing and Painting, and although over the next seven years their paths ran on separate courses, converging occasionally at parties and professionally, their talents finally crystalised in 1962.
lt was on a warm summer evening in that year that Ronnie sat in the sardine-like audience of The Waverley Bar, St Mary's Street, Edinburgh, the then haven of Scottish Folk-music, to listen to the first group performance of Roy, Bill, Ron Cruikshank and Paddie Bell. A few weeks later Ron Cruikshank unfortunately contracted glandular fever and had to give up singing. The group suddenly became desperate to make up their number in order to fulfill a Fringe engagement which had been accepted for the duration of The Edinburgh Festival. Roy suggested that they approach Ronnie who by that time had displayed an interest in Scottish Folksong and had been in the habit of diddling along with Roy at occasional parties, purely for fun. In fact it was at one of these parties that the remark was made jokingly, ". . . . you two could become another Hall and MacGregor". So it was then, that at a long and strenuous rehearsal in Paddie Bell's Buckingham Terrace flat, the name of the group was dreamed up . . . . and The Corrie Folk Trio and Paddie Bell was born. Why "Corrie"? Well, the word Corrie crops up in place-names all over Scotland. It means a circular hollow on a mountainside, or if you like, a hanging valley. It's a word which conjures up pictures of mist-covered mountains, forests and rivers. It would appear also, that The Covenanters practised their religion in the corries in the hills surrounded by armed sentries. Add to the visual pictures the sound of singing wafting over the mountain air, mingled with the clatter of sword against armour, and you have a very romantic image. No? The tiny Tryst Coffee House on Edinburgh's High Street saw the first performance of the new group. They performed four half-hour sessions per evening, six nights a week for the three weeks of the Festival. The first-night, first-session audience of eight customers, swelled by the end of the engagement to full houses every night. Indeed in the last week, as the audience from one half-hour dutifully trooped out, many of them were seen to join the queue again which by that time had formed for every session. During the next year there built up engagements in and around Edinburgh, like The Gamp Club, The Bothy, The Crown Bar and The Waverley Bar. The Group even ventured over the salt-sea . . . to Kirkcaldy Folk-song Club, for the princely sum of £5. The taxi to the station cost £1 and 2 shillings, and four return rail fares to Kirkcaldy cost £1 and 8 shillings. The rest was split evenly amongst the members of the Group. Such riches. There were never-to-be-forgotten trips to Dunfermline's Howff Club in The Scottish Patriot's van, via The Ferry, returning by Kincardine Bridge. The Forth Road Bridge had not been completed at that time. 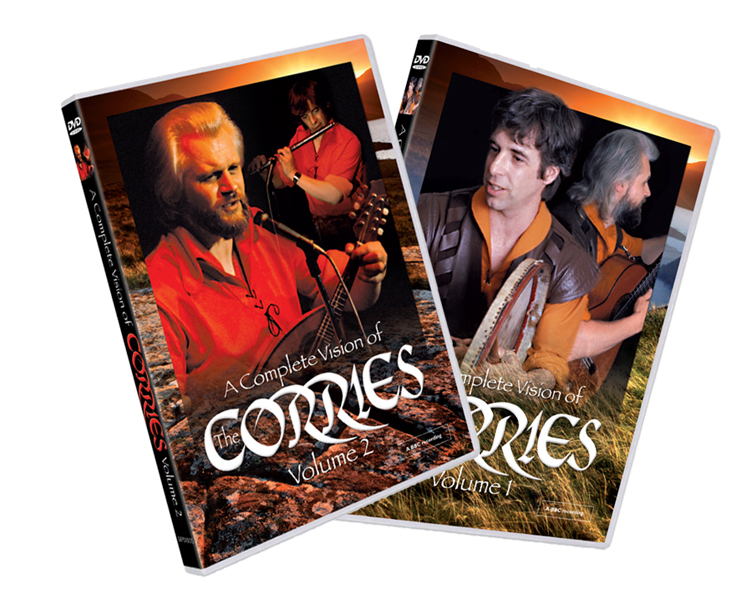 The Corries' thanks are offered for the support and encouragement of families, relations and friends like the late Wee Wattie Wright, Colin McKie, Lyall Borland, Geordie Hamilton, to name only a few, especially since in those first days none of them could be said to be doing it for money. It's also interesting to note that on one occasion Dolina McLennan gave up her fee as presenter, motivator and resident singer at The Waverley Bar to The Corrie Folk Trio and Paddie Bell. The fee was the flat rate of 10 shillings. That's 50p young folk. 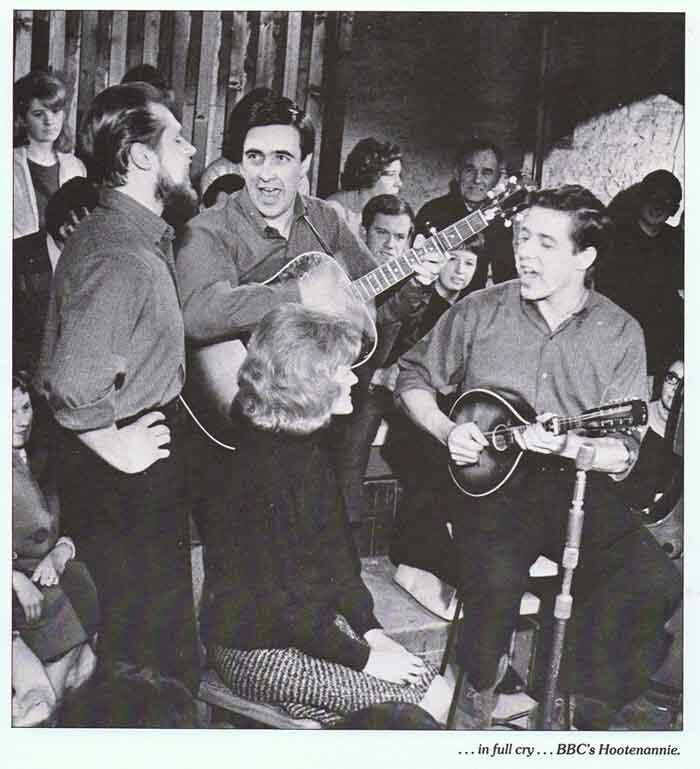 During the Edinburgh Festival of 1962, Rory and Alex McEwan, well remembered for their Tonight appearances on Network Television, had promoted a Folk-show at Edinburgh Ice-rink. Amongst their guests were The Clancy Brothers and Tommy Makem making their first ever appearance in Britain. In the summer of 1963, The McEwans hosted their own Folk-series on BBC TV and on June 20th and 21st, 1963, The Corrie Folk Trio and Paddie Bell were invited to make their first ever television appearance anywhere. ln 1963 television was in black and white, but large green pills were the order of the day to quell the nerves. 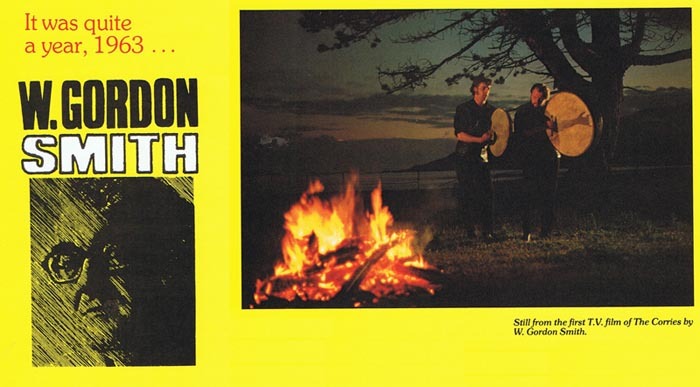 After an exploratory trip to Kilrush in Southern Ireland for a Folk-festival, followed by weekend appearances in North Berwick's Harbour Pavilion Summer Show, starring Moira Anderson and Bill McCue, Rory and Alex invited the Group to do a guest spot on their 1963 Festival Show. The next week, exactly one year after their inaugural full-houses at The Tryst, the Group promoted their own unofficial Festival Fringe Folk-show at The Goold Hall, St Andrew Square. Initially planned as a show-piece for the Group itself, and with Ronnie's wife Pat taking tickets at the door and selling biscuits at half-time, their own part in the show was whittled down to a few songs by the end of the week, to make room for so many guests. Singers like Liam Clancy, Joe Heaney, Hamish lmlach, Gordon McCulloch all appeared alongside solo spots from Banjo Barney McKenna, Keiron Bourke and the late Luke Kelly, these three the nucleus of what was to become a world-renowned legend called The Dubliners. 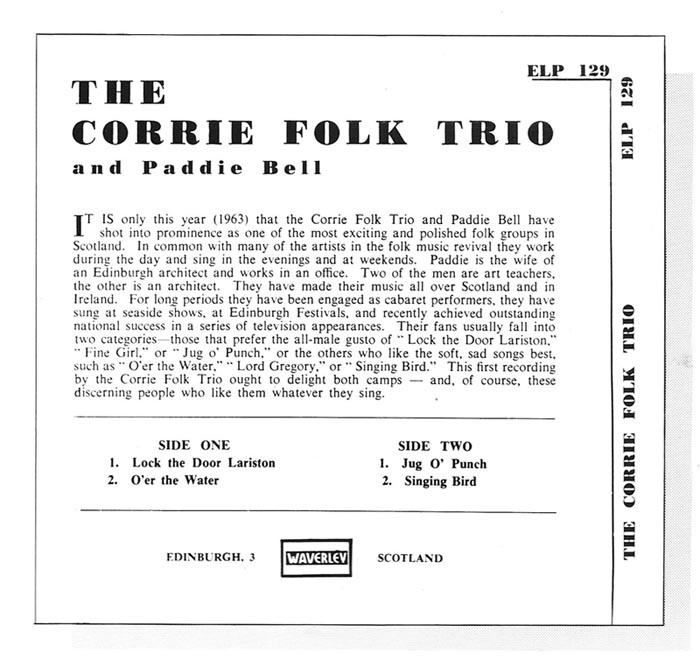 On September 10th, 1963, The Corrie Folk Trio and Paddie Bell made a guest appearance at The Crown Bar to celebrate the issue of their first recorded music . . . Waverley, ELP 129. From obscurity to television, concerts and records had taken one year. Had The Corries arrived? The following video clip is a bit scratchy but it's the only clip I have ever seen of the Folk Trio with Paddie Bell. If you have a better one please let me know! John F. Kennedy rode to his death in downtown Dallas. Hugh Gaitskell died and Harold Wilson began his long stint as leader of the Labour Party. Russia put the first woman into space. The Profumo affair rocked the nation. Good Pope John died in Rome. Philby fled to Russia. The Great Train Robbers stole £2.5 million. A Scottish earl became Prime Minister. The Beatles sent the Liverpool sound rocking round the world. And I heard The Corrie Folk Trio and Paddie Bell for the first time. It would be refreshing and satisfying to be able to recall a thrill of discovery, a quickening of the blood, the instant recognition of raw talent, which properly nurtured, would go on to dominate Scottish folk music for a quarter of a century. It would also be totally untrue. As a young producer ploughing many fields for BBC television in Scotland I was asked if I could make a pilot programme for London light entertainment department. They wanted folk music. At least that's what they thought they wanted. Looking back on it now I suppose they had some vague vision of Andy Stewart och-ayeing his way through "Stop Your Tickling Jock". They suggested Val Doonican as the presenter. That fact more than any other revealed their ignorance. Folk music to their ears was a bunch of unaccompanied Waly-Walys deedling hey-nonny-nonnies. What they did not want - a serious attempt to reflect on television the performance and passion of the folk music revival - was, after a lot of in-fighting, precisely what they got. I envisaged a non-stop half-hour of varied music. No inane chat, no self-serving introductions, a lively committed audience, the whole thing happening in a smoky cellar. Above all I needed a resident group of gutsy performers, Scottish, capable of sustaining an extensive repertoire, persuasive enough to rouse lusty choruses, talented enough to sing like linties when they got the chance. The Corries and Paddie seemed to me to have that potential, but sadly lacked experience. And they were amateurs in the true sense of the word - there were mouths to feed and rents to pay and the money for the necessities of life came from good secure jobs. The pilot programme put nothing at risk, so The Corries fronted the show, the audience was, to a large extent, their own audience, and London liked what they saw and heard well enough to commission the first series. What should have been called simply "Hoot'nanny" became "The Hoot'nanny Show". That concession to the light entertainment jargon seemed a small price to pay for the chance to expose the entire British nation to 13 weeks of honest folk ceilidh, produced in Scotland, at prime viewing time. When it became obvious that the show was successful, that The Corries were capable of maintaining and developing the resident group role, and likely that other series would automatically follow, it was equally apparent that they would have to give up their jobs and take the major risk of being able to make their living as entertainers. I clearly remember my own conflicting anxieties; I regretted putting their domestic security in such hazard, yet I believed in their ability and needed them as the foundation of the next series. The rest is, as they say, history. 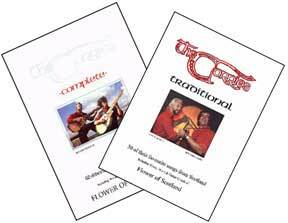 We made about 40 programmes together, I produced their first LPs, toured with them, took them into memorable Usher Hall concerts, and - I hope - encouraged and guided them towards even higher standards of professional performance. Nostalgia usually favours the earliest days, probably because crises caused by anxiety and accident and ineptitude can, in retrospect, seem much funnier than they were at the time. We were all busking it in more ways than one. Certainly l have fond memories of the sweaty cavern in Victoria Street, of the atmosphere a very special audience brought to every show, of the regular performers - like Ray and Archie Fisher, Nadia Cattouse, the Ian Campbell Folk Group, The Spinners, Martin Carthy, The Dubliners, Julie Felix, Cyril Tawney - and special guests like Tom Paxton, the New Lost City Ramblers, Peggy Seeger and Ewan McColl. But at the heart of every production, first songs on the running-order and therefore the scaffolding on which every show was built, there were The Corries and an up-tempo opener like Lock the Door, Lariston, a singalong closer like The Roving Ploughboy, and a solo like Jock o'Braidislee for Ronnie or Lord Gregory for Paddie. Week in week out, songbooks scoured, albums plundered, memories wracked. An unremitting, punishing schedule. In those days Ronnie Browne's strong tenor voice and swashbuckling presence - "he looks like Captain Bloody Kid", said my London paymasters - gave the group much of its energy. Bill Smith's thrashing guitar seemed to flail them along. When I asked one of my tiny daughters which of The Corries she preferred she pointed to Bill on the screen and said, "that one." I asked why. "Because he's the driver." Roy Williamson was always the musician, bringing sensitivity and technique together to lay the foundations of the group's characteristic interpretation and arrangement of their material. And Paddie's fine purity of tone and pitch in traditional ballads gave The Corries an extra dimension and earned her the reputation of having to rejoin the fairies at midnight. As it happened, one of the most successful folk productions I ever presented - "Folk is Singing" at the Royal Lyceum Theatre, Edinburgh, at which a somewhat unsteady Lord Provost led the choruses from the equivalent of the Royal Box! - was the last time that the Trio and Paddie worked together. Then, in no time at all it seemed, there were only two. Bill Smith, an important voice and even more important other guitar, went his own way. The following video clip is from a very early Folk Trio recording of the song "Rare Old Mountain Dew". 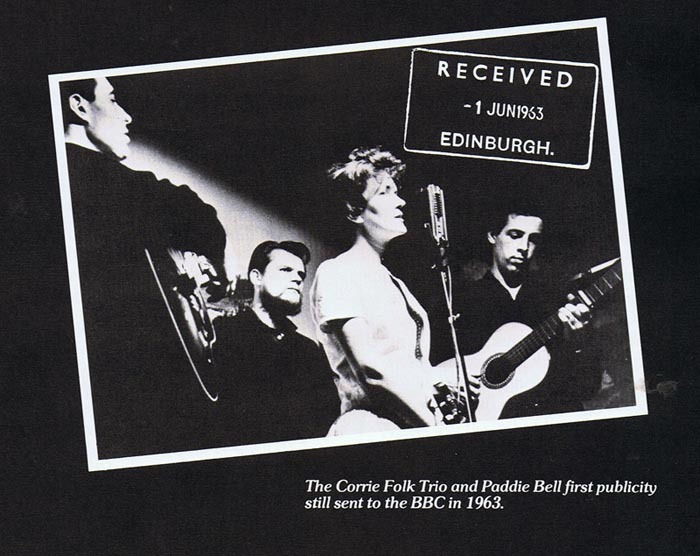 It is the only recording I have ever seen of The folk Trio performing without Paddie Bell. If you know of any other ones please let me know! I was not alone in thinking that the days of the survivors, Ronnie and Roy, were severely numbered. Looking back I am, of course, relieved and flattered that my judgment was right - The Corrie Folk Trio and Paddie Bell were, indeed, good enough to meet the needs of network television and do a lot better than merely keep swimming in the treacherous waters of show business. But nothing the original group achieved bears any comparison with the success of The Corries as we now know them. Yet we take too much for granted. 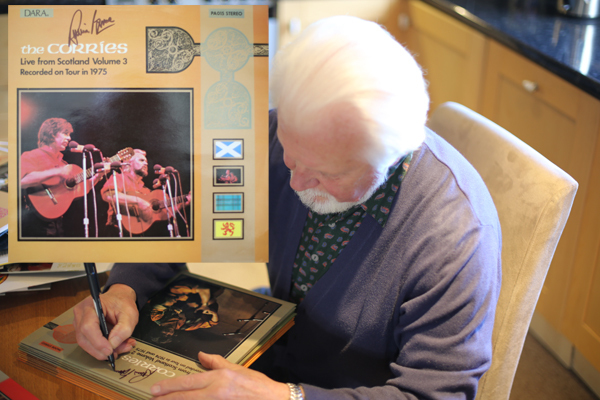 How many of us can conceive of the task that lay before Ronnie Browne, faced with instruments that, up to then, he had touched only when moving them from one gig to another? If The Corries were going to survive he would have to learn to play the guitar, the banjo, and ultimately the daunting combolins. And well enough to satisfy his partner's notoriously demanding musical standards. What about shy, retiring Roy - for so he seemed on the public platform - could he back up Ronnie's vulgar bravura with some expression of his own personality? We know now that they have achieved all of that and more. That Ronnie sometimes feels positively Segovian as he glides gracefully from chord to chord. That Roy delivers shy one-liners with the aplomb of a stand-up comic. And we also know - but it's not said often enough - that they are an institution, a show business phenomenon, and an artistic business enterprise which constantly regenerates itself and its audiences and that they can go on doing it for as long as they have the will to continue. On top of all that - and at the heart of their personal and professional lives - are other factors. Like respect for their culture and heritage. Their obvious affection for the music of their land. Their intuitive knowledge that entertainment is about people and the pleasing of people. That if it ever stops being fun for them it will never be fun for anybody.